It is of crucial importance that a correct roster of membership be kept by the Secretary. The Secretary should work with both the Chapter Advisor and National Headquarters to keep an accurate record of current members each academic year. The Secretary is more than welcome to contact National Headquarters, if they desire a list of recent inductees/new members for their Chapter. 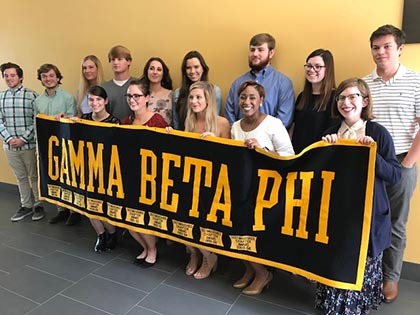 It is the duty of the Secretary to ensure that the chapter keeps up-to-date documentation of current/active members each semester (students who have paid their local/chapter dues each academic year & students who have completed their chapter-based requirement of points, along with the inclusion of new members/inductees each academic year). The Secretary must take careful notes of the proceedings of the meeting, prepare the minutes, certify their correctness, and enter them in the official minutes book. The minutes should set forth the time and place of meeting, state the general purpose, and the main item of business discussed. The exact wording of each motion is needed, along with the name of the person moving it, and whether it carried of failed. There should be a clear record of any motion that was discussed at a subsequent meeting, or of any unfinished business. During the business session, the Secretary should read the minutes of the preceding meeting for correction or approval. Any correction must be entered into the minutes book and initialed. The Secretary attests with his or her signature that the minutes have been approved by the members as the official minutes and should record the date of approval. If the Internal Revenue Service performs an audit of the chapter, copies of the minutes will be requested. The minutes should be immediately available and in good order. Some chapters may prefer to elect, or have the President appoint, a Recording Secretary specifically for keeping the minutes and have the regular Secretary handle the other duties. This would seem an especially wise decision if the chapter is a large one. Another alternative is to have a Corresponding Secretary. Be clear, concise, and complete. Lack of communication can be avoided if the writer will present the message briefly, but fully, with clarity. Include your return address and the date in the upper right-hand corner of the first page of the letter. Put your return address on the envelope. Be punctual in answering any communication addressed to your chapter, and when replying, be sure to indicate in your first sentence the nature of the matter being replied to and the date of the communication being answered. It is very important that you keep a correspondence file containing copies of all letters and forms you send out. Also keep a file of important letters received. The chapter President and the Advisor should be kept up-to-date on all correspondence of consequence. The Secretary should bring to each meeting the book of minutes; a copy of the Bylaws, rules, and policies; a list of the members; a list of standing and special committees; and, a copy of the parliamentary authority, Robert’s Rule of Order, which is the parliamentary authority within the Society. The Secretary should assist the President before each meeting in preparing a detailed agenda; prepare and send required notices of meetings and proposals; keep a file of all reports submitted, keep a correspondence file; and, a book of adopted policies and procedures. He or She is also responsible for calling attention to deadlines for taking certain actions.